Stroke can impair motor and/or sensory systems in very different ways depending on the individual (Teasell & Hussein, 2013). Currently, many neurological measures of the functional consequences of stroke use very coarse scales and/or rely of the subjective judgements of clinicians (Scott & Dukelow, 2011). In our lab we are developing a suite of behavioural tasks using robotic technology and virtual reality to quantify sensory, motor and cognitive impairments in subjects with stroke or other neurological disorders. Each behavioural task generates various metrics (biomarkers) of motor performance and subject performance is identified as impaired or not based on comparisons to a large cohort of healthy controls. 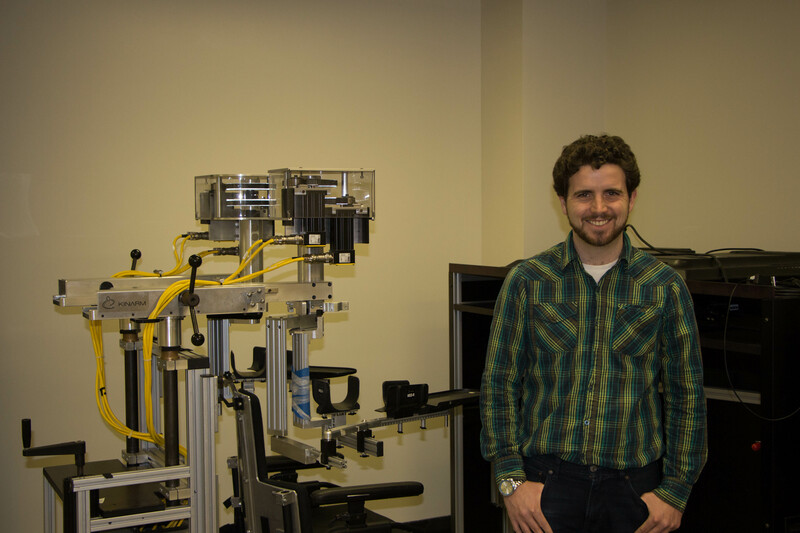 Teige Bourke beside the KINARM robotic exoskeleton. In this study we designed a task to assess how people respond to unexpected external disturbances as they maintain a fixed arm position. We often need to rapidly correct for such disturbances, such as when holding a cup of coffee and being bumped in the arm, or slipping on the stairs and reaching for a handrail. Furthermore, recent theories suggest rapid sensory feedback is important to successfully control motor action (Scott, 2012). Our hypothesis is that subjects with stroke will commonly display impairments in the use of sensory feedback for motor action, and thus show delayed and inaccurate corrective responses when mechanical loads are unexpectedly applied to the limb. Subjects with stroke had individualised patterns of impairments in responding to a perturbation as compared to healthy control performance. The majority of subjects with stroke were slower to respond to a perturbation (79%), slower in returning towards the target (79%), and less accurate in their movements (74%). Many subjects with stroke had more instability in their arm posture (44%) and less coordination in their individual joint movements (47%). Interestingly, impaired ability to respond to perturbation was often found in both arms of subjects with stroke. Having visual feedback of their hand position enabled subjects with stroke to have a more accurate endpoint to their movements, but the improvement was only partial for some subjects with stroke, and none of the other parameters were improved by having visual feedback. We also quantified several clinical measures of function and ability, and we looked for relationships between those scores and the perturbation response impairments. Greater dysfunction indicated by clinical measure scores was most strongly related to perturbation response impairments in the ipsilateral arm – i.e., the arm on the same side of the body as the stroke, classically thought to be less affected by the stroke than the contralateral arm. The impaired ability to respond to forces in our environment, as shown in this study, has functional implications for activities of the daily lives of people who have had a stroke. The presence of bilateral impairments means people may not be able to successfully compensate with their less affected arm in daily tasks. Also, an impaired ability to respond to forces in our environment may contribute to a risk of falling. This study is part of an overall research program designed to create more objective and quantitative assessment methods that could help lead to more individualised rehabilitation therapy post-stroke. This work in particular emphasizes the importance of assessing function thoroughly in both arms after a person has had a stroke and points to the possible need for bimanual rehabilitation strategies for people with stroke to help them achieve the greatest functional recovery. Bourke T C, Coderre AM, Bagg SD, Dukelow SP, Norman KE, Scott, SH (2015). Impaired corrective responses to postural perturbations of the arm in individuals with subacute stroke. J Neuroeng Rehabil, 1: 7. Teasell R, Hussein N (2013). Clinical Consequences of Stroke. In: Evidence Based Review of Stroke Rehabilitation. Scott SH. (2012). The computational and neural basis of voluntary motor control and planning. Trends Cogn Sci. 16:541-549. ← Human muscles fascicles: what can ultrasound and diffusion tensor imaging reveal?